Have you ever read the Pilgrim story, The History of Plymouth Plantation by William Bradford? What you read might shock you because it doesn’t line up with the Thanksgiving story we’ve all heard from childhood. Everyone thinks of the Pilgrim story as one of heroic people. After all, they escaped religious intolerance in England and came to the New World. They survived storms, sickness, leaky boats, and still managed to make it across the ocean. Once they arrived, they survived bitter cold, starvation, and even more sickness (183). And everyone knows the story of how a nice Native, Squanto, helped keep them alive and everyone celebrated together the next fall after the harvest. But people might not realize that that story only has a grain of truth. The Pilgrims didn’t treat Indians very nicely at all. 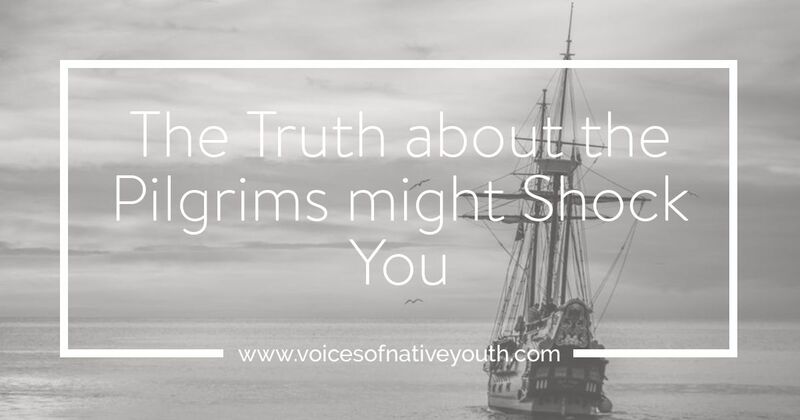 Even though they were Christians, the Pilgrims treated the Indians unfairly. The pilgrims took part of their goods, like corn, which the Natives had buried (171). They knew that the corn belonged to the Indians, but still took it. Pilgrims also walked into Native homes without permission. The Pilgrims found two of their matt-covered houses with food and tools inside. When the Pilgrims thought that the Indians had run away, they decided to take what they wanted—including corn, beans, and tools. The Pilgrims saw that they were just a bunch of nobodies and treated them horrible by taking important things from them. The Pilgrims were unfair to the Indians, they didn’t treat them very well. They took advantage of the Indians by learning their ways from Squanto. Squanto spoke English because slavers had captured him when he was a child and taken him to Europe. When Squanto returned, his people had all died. He befriended the Pilgrims and directed them how to plant their corn, where to take fish, and helped them to ‘procure other commodities.’ He also acted as ‘their pilot to bring them to unknown places for their profit’ (172). Squanto stayed with the Pilgrims until he died. The Pilgrims left no record of doing anything for Squanto, and they just took advantage of him. Squanto helped them survive, but they did nothing for him. The Pilgrims stole from the Natives and never returned it back. The Natives did steal from the pilgrims once, but they returned the things they stole back to the Pilgrims (187). The Natives acted fairly by returning what they had taken, but the Pilgrims didn’t have the same courtesy. What the Pilgrims did wasn’t right, they had used Squanto for his skills to guide to them until his death. Pilgrims were greedy and stole much from the Indians and never returned anything. The Pilgrim found land occupied and decided to call it theirs. Even though the land was cleared, just because the Pilgrams didn’t see anyone they called it a “Divine Providence” and moved in. The Pilgrims did not care to ask anybody whose land it was. The Indians saw the Pilgrims on their land and felt confused. When the Pilgrims saw the Indians, the Pilgrims didn’t care who’s land it was and decided to use force against the Indians for their land. They killed Indians, and scared them away by shooting their guns. The Pilgrims stole from the Indians without returning what they stole. Pilgrims saw that the Indians had no records that they could understand and used this as an excuse to treat them unfairly. The Pilgrims used the Indians for support and used them to survive without keeping any record of their help. The Pilgrims took land from the Indians using force and didn’t acknowledge the way they did it. People think the Pilgrims were nice and good to the Indians, but clearly they were not. Thank you for stopping by and giving your time to read my article, I appreciate it. So sad but true. To me if you aren’t acting like a Christian (a follower of Christ) you really aren’t one. A true follower of Christ would treat people like Jesus did. Thank-you for sharing this perspective. It is painful to read about the sins of people and yet we have to acknowledge that we are all sinners. I agree that what the pilgrims did in taking property that belonged to Native Americans was not “the providence of God”. Thank you for the time you have given to read this article.